I ate my brunch in front of the television, (a usual thing when am hooked to the tv) and after a long wait due to commercials and a UFC teaser to pump my adrenalin.... Can you just imagine my shock when my idol Forrest got knocked out on the first round???? Yes, it was so quick, I didn't even get a chance to get myself together for the fight!! I really felt bad for Forrest, all that hard work and preparation and to be beaten only a few minutes on the first round. Silva was indeed a tough guy to fight and even if he beat my idol (literally and figuratively), I salute him for being the better man and being a sport. I say that because when Forrest got knocked out, he really did offer to help him out and that makes him a better man in my eyes. 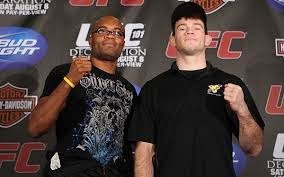 My heart goes out to Forrest though (the Josh Hartnett pretty boy of the UFC ring) and I hope that he learns a good lesson from that fight and it makes him a better person/fighter. I hope to see a rematch though. No, not because I want to see my pretty boy get all bruised but because I think that it would have been a more interesting fight if "there actually" was one. So, I'll be waiting for the rematch.... soon. 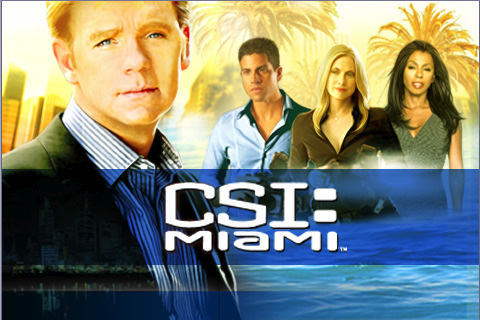 After the very disheartening result of the UFC fight I waited for, I flipped channels and found myself watching one of my favorite shows in AXN - CSI Miami. The last previews they've been showing is that of my idol Horacio Caine being shot and killed and THAT was an episode I was not planning to miss. And again, just in time I was to watch the show. The episode revolved around a huge gun-running business in Miami and the people who have been killed in the midst of all the business going on. Now, if you were a Horacio fanatic like me, you'd know that his character is probably the most personal in all of the CSI franchises. He's the one character where most of his personal life gets entangled with his work. He's been to Brazil to stop an entire drug syndicate responsible for the death of his new bride, he's messed with the prison inmates just so he could protect his son who was in jail, and in this episode he got personal again with one of the big fish in the gun business. Yes, I was crying my heart out as I watched H lying on the ground, alone, helpless and probably dead. I hated everyone in the show and I felt like they betrayed Horacio and that made me feel betrayed as well. I wanted to run to Horacio and help him up and at the same time, I wanted to know who was responsible for his death and I wanted them to pay for it as well!!!!! I will have to see the next episode because I don't think CSI Miami will ever be the same without Horacio Caine. Horacio Caine IS CSI Miami. I don't know what it will be without him. I secretly am hoping that just like any Fernando Poe Jr. movie, he will come to life or be in some other form BUT that he will still be there. I really hope so. Because if not, I think I am going to write to CSI Miami and give them my two cents about killing H like that. That, or I'll just stop watching the show. He is the only reason I watch it anyway so what is the point now??? I see none. Yes, I get carried away with the shows I see on TV. I am after all a certified couch potato. hehe..
On a lighter note though, I watched Iron Chef this afternoon and again was just in time (do you see the pattern here) to see who else but my favorite Mario Batalli (or Battali, unsure of the spelling) battle it out with a friend and fellow Italian whose name I can only connect with Pavarotti. As usual, he is as calm and composed as he is and very suave. I just love the guy! He whipped up some scrumptuous delicacies with the secret ingredient rice (my fave again!). And as always, he won the battle. 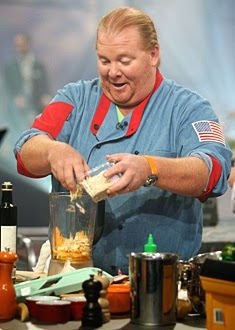 He is just a culinary master indeed!!!! I gained more respect for him on this battle as well because for the first time, one of the hosts, Elton/Alton Brown was actually served the five course meal. He even got to taste one of his succulent drinks before it was even served! You would see him eating the food while hosting, it was fun and I like that they added that touch to the episode. When Mario was announced as the winner, I of course, clapped my hands and was victorious not only for him BUT rather with him. Him having one that battle made me feel like a winner too! So, you see..... I take my tv shows very seriously. So seriously that I'd lose with them, die with them and even win with them.